Julep's new "better than BB cream" offering ... Is it really? Inactive Ingredients: Castor (Ricinus Communis) Oil, Cetyl PEG/PPG-10/1 Dimethicone, Diethylhexyl Carbonate, Ethyl Macadamiate, Ethylhexylglycerin, Glycerin, Glyceryl Behenate, Glyceryl Dibehenate, Hexyl Laurate, Hydrogenated Castor Oil, Hydroxypropyl Cyclodextrin, Isododecane, Magnesium Sulfate, Microcrystalline Wax, Neopentyl Glycol Diheptanoate, Palmitoyl Tripeptide-38, Phenoxyethanol, Phenylethyl Resorcinol, Phytosphingosine Extract, Polyglyceryl-4, Isostearate, Potassium Sorbate, Propylene Glycol Dicaprate Esters, Silica, Sodium Benzoate, Sodium Chloride, Tocopheryl Acetate, Tribehenin, Water. May Contain (+/-): Titanium Dioxide (CI 77891) Iron Oxide (CI 77492) Iron Oxide (CI 77491) Iron Oxide (CI 77499). Julep calls this "a dynamic do-all makeup that goes beyond BB crème to moisturize, prime, perfect, and protect — both instantly and over time." Their blog post on choosing the correct color for your skin says it's meant to be used either as a moisturizing lotion or as a lightweight foundation, and supposedly it "warms up as you work it into your skin and absorbs so you’re left with a soft, smooth, and hydrated natural tint." Not sure how "warms up as you work it in" is a feature — I'm thinking that's what anything does when you put it on your face, because, you know ... your face is warm, relatively speaking. How Julep says to use it: Apply a thin, even layer. Work the product in using a brush or a circular motion with your fingers. Gradually re-apply where you need more coverage. Pretty standard squeezey tube applicator tip. Since it uses a name format obviously inspired by BB cream, and the directions sound similar to those for BB cream, I applied it like BB cream: I used my fingers to dot it all over my face, then blended it with small circular motions of my fingertips. Where I needed more coverage, I dabbed on a little more and blended by tapping. As with BB cream, I applied this over my usual light moisturizer. My first impressions were that it looks pretty orange compared to Asian BB cream, it's a lot heavier and goopier, and it smells strongly of sunscreen. The texture before blending reminds me of Maybelline Dream Fresh BB cream. Unlike the Dream Fresh, I can apply this on my eyelids, and it doesn't sting or feel like it's getting in my eyes. Hurray! 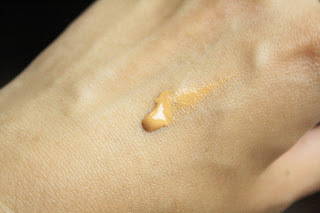 It does blend easily, and is much less orange once it's blended, but it takes more time for me to get the coverage I need than with my usual daily foundation (Missha M Perfect Cover BB cream). The results weren't stellar enough for me to think the extra time is worth it. It leaves a slight shine on my face and doesn't seem to absorb completely. The shine isn't the same subtle glow as the skin on my shoulders has, but is more of a slickness that reminds me of mid-90s drug store makeup on my teenage skin. I have to give it an "eh" on the claim that it looks natural. Since my face is slightly oil-prone and to see how it applies to non-moisturized skin, I tested the DD crème on some other parts of my body. On my shoulder, where the skin is a little dry, and tanner than the skin on my face, the crème blended really well and there was no extra shine, but the skin didn't feel very moisturized. 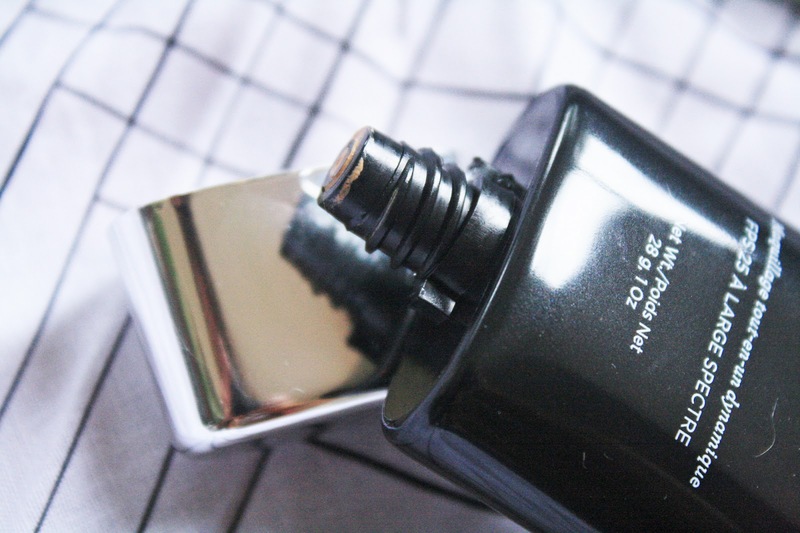 On the décolletage area, it blended well and the finish was completely natural, but a thin layer did nothing to cover the minor redness of a tiny bug bite. When I put on enough to cover the redness, the skin began to look more shiny and less natural — yep, just like on my face. I didn't notice any smoothing effects anywhere I tried the crème (so a big "NOT!" on the "ultra-smoothing" claim, because believe me, my skin could use some ultra-smoothing). The nonexistent texture improvement is on par with tinted moisturizer rather than BB cream or foundation. If this stuff minimizes my pores, the effect is indeed minimal (ha, ha ;P ). The color doesn't sink into my pores to accentuate them, though, and it doesn't make my pores look larger, so at least that's good. Medium coverage; moderately buildable. Better than Maybelline Dream Fresh, but not as good as Missha M Perfect Cover. Didn't completely cover my active acne discoloration, but with more than one layer of application, it did cover generalized redness and old, healing discoloration. However, to get good coverage, I had to apply enough that my face was too shiny, so that I felt setting powder was a necessity rather than an optional step. Also, I wondered if piling on the makeup was just asking for a breakout or an oil spot to form, but the shine didn't seem to get worse, and neither did my skin. After I washed my face that night, my skin seemed the same as before I tried the crème. 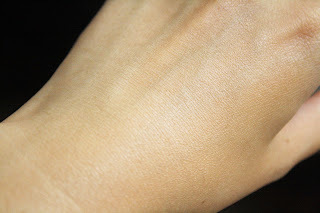 Julep's DD crème in medium is an OK match for my yellowy-olivey skin (better than Maybelline Dream Fresh's medium), but still seems slightly orangey compared to my tanned shoulders, and it feels dark compared to the brighter tones of Asian BB cream. If you prefer a tanned look instead of a bright, fresh-faced look, the medium shade might work for you. Slightly orangey color and somewhat thick texture before blending. ...but it blended really well with the skin on the back of my hand! While I'm on the topic, the guidelines for how to choose your color are ... interesting. They're based fairly heavily on your skin's tendency to tan, or not tan, as the case may be. Following the guidelines, I would have pinned myself as a medium-dark: The light shade is recommended for those who burn easily in the sun, and medium is for those who "can build up a small tan during the warmer months." Me, I tan like a mofo at approximately the speed of light. And "year-round golden" — one of the skin tones for which medium-dark is recommended — sounds like it describes my skin better than "fair-skinned all year" or "not quite fair-skinned" with slight tanning tendencies. In actuality, after trying the medium shade, I'm wondering if light would have been better. So ... yeah. Take the color-picking guidelines with a huge grain of salt. The photos in the color-choosing blog post (linked in the paragraph above) are more helpful than the written recommendations, so definitely check them out if you decide to try this stuff. It's a tad expensive at full price — $36 for one ounce. That comes out to more per ounce than some BB creams from Urban Decay, Boscia, Bobbi Brown, Too Faced, and Dr. Jart+, and also more per ounce than CC creams from Lorac and Clinique. It's a more reasonable purchase at the Maven price of $28.80, but it doesn't seem to offer anything special to make it stand out from the competition in that price range. I know Julep is marketing this as some kind of revolutionary product, but to me the benefits list makes it sound like just another BB or CC cream. As a foundation: I doubt I'll be using it alone as a foundation unless I'm desperate, because I have other light-coverage makeup that matches my skin color better and/or at least leaves me less shiny. This doesn't provide the coverage I want in a foundation, yet isn't more comfortable than a true foundation or a BB cream. As a primer: It doesn't seem to refine my skin texture, it's a little oily feeling for a primer, and it doesn't absorb completely like a good moisturizer. I'm not sure whether it would help foundation stay on longer or look better, as I haven't tried it, but my blush didn't go on as smoothly over this plus powder as it does over Asian BB cream set with powder. 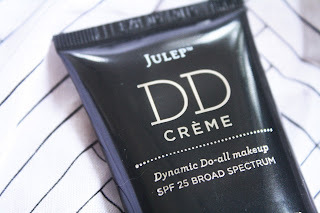 As a tinted moisturizer with SPF: This seems like the best use for Julep's DD crème, for those who want sun protection and to even out skin tone or cover mild redness, but who don't have very much to correct in the way of texture or discoloration. It does seem to provide some moisture, and there's enough coverage that it's worth using as makeup, unlike some tinted moisturizers that barely do anything. Since it just got here, I can't say anything about any long-term anti-aging or skin-perfecting effects, but obviously those would make this stuff more appealing. "Dynamic do-all makeup" and "first-of-its-kind performance crème + new generation makeup" are pretty much marketing hype, from my experience so far. Julep's DD crème isn't a bad product, but it doesn't seem to stand out in the BB cream/CC cream market. Yeah, yeah ... anti-aging, sun protection, skin improvement "instantly and over time." Yaddayadda. Just like everything else. Recommended for: People who are already Julep fans, and/or who want a tinted moisturizer with SPF. This DD creme is my ultimate solution if carrying all necessary make up in my bag. Now I will just need to carry this creme which will serve the purpose of all other cosmetics.